Perfetly summing up the expertise of Maurice Lacroix, the Masterpiece collection establishes its timepieces firmly in an urban, dynamic and elegant vision of the 21st century. 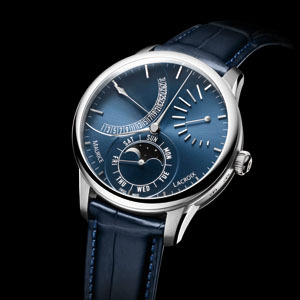 The brand’s flagship range distinguishes itself in the interpretation of complications, especially of the retrograde and lunar indication type. 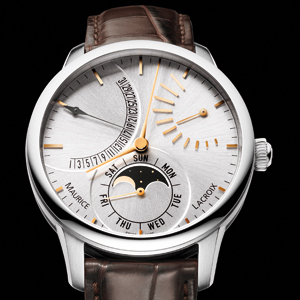 The Masterpiece Lune Retrograde provides a splendid demonstration of this expertise. 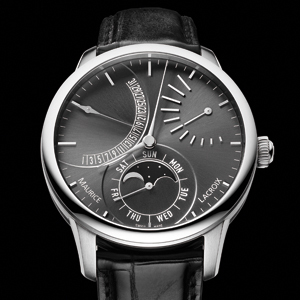 The moon pursues its path at 6 o’clock, moving across a black design providing a striking chiaroscuro backdrop. It dominates the upper part of the royal blue or silver-toned dial, while sharing its space with the hand counting off the days. The date appears at 10 o’clock in a broad retrograding arched segment, while the power reserve is dynamically displayed at 2 o’clock. The entirely in-house manufactured automatic ML 192 movement reveals its vertical-brushed and broadly snailed “Grand Colimaçon” finishing through the exhibition case-back, admirably reflecting the light playing across its jewels. 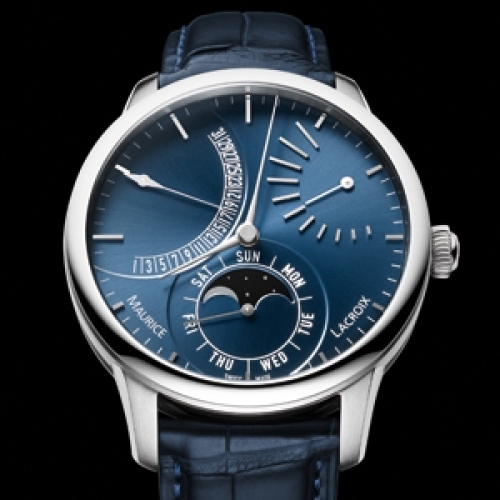 A profound sense of authenticity shines through this model that embodies a decidedly mature approach to time.